The Overwatch team wanted to jump out of the gate with a bang, so they gave us a new developer update video on the second day of the new year. 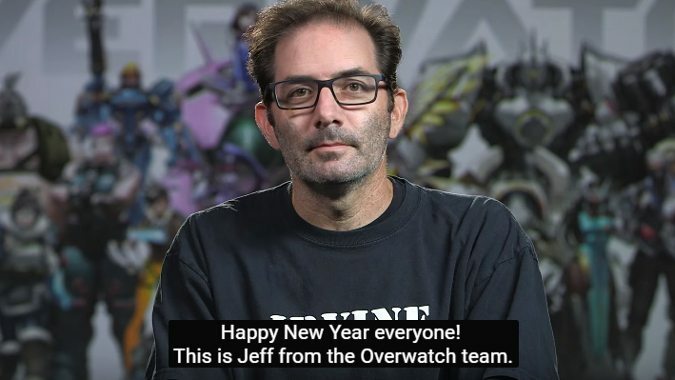 Jeff “Jeff from the Overwatch Team” Kaplan began with a retrospective of the things added to the game in 2017, starting with the Oasis map at the beginning of the year. Then, he went on to both openly discuss and vaguely hint about what the team’s plans are, looking forward into the new year. The first new thing Kaplan confirmed was “Hero 27,” though he didn’t give us any information beyond that, not even a “Soon.” What he did say is coming soon — possibly by the end of January — is an update to the base loot box. While getting new stuff through events is cool, the fact that all that great content is time locked to a single event every year is a bit less so. However, there will also be new updates to events, both to make them fun for newbies and returning players. This year is the Year of the Dog, so I’m secretly hoping for more adorable puppy emotes like Orisa’s from the Lunar New Year event, for which Jeff promised “significant content.” Jeff also said the Uprising event, celebrating the anniversary of the launch of Overwatch in May, will also get a bit of a facelift. Jeff glossed over some of the systems changes they’ll be using in both the long and short term, citing the changes for competitive season eight as an example. Lastly, Jeff promised some more story beats. He specifically promised more reactions from the cast of heroes to Winston issuing his recall in “Recall.” We’ve seen Mei and Reinhardt starting their journeys to Winston’s side in their animated shorts. Jeff indicated we may see more of those. as well as comics coming in the future too. Although vague in places, there’s still a lot of information Jeff gives out in the video, so make sure you watch it if you’re interested in all the details.